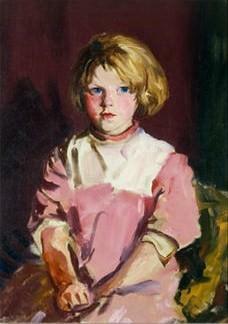 Robert Henri, Girl In Pink (Annie Lavelle), 1928. Oil on Canvas. Mount Holyoke College Art Museum, Gift of Mr.and Mrs. Roy R. Neuberger. The Mint Museum of Charlotte, North Carolina presented the iconic paintings of American artist Robert Henri in the special exhibition From New York to Corrymore: Robert Henri and Ireland (7 May – 7 August 2011). Organized by The Mint Museum and sponsored by Bank of America, this was the first exhibition to examine Henri’s fascination with the Irish landscape and people, particularly children. The exhibition will travel nationally following its debut at the Mint. As the leading figure of the group known as the Ashcan School in New York City, Robert Henri (1865-1929) significantly influenced American art in the early 20th century. Born in Ohio, he moved with his family to New York when he was a teenager. He studied in Paris at the Julian Academy, where he embraced Impressionism. Henri continued his studies at the École des Beaux Arts and the Pennsylvania Academy of Fine Arts. In 1908, he organized a landmark exhibition by a group of artists known as “The Eight” to great acclaim. Henri’s early works concentrated on landscape, but around 1898 his focus shifted to portraiture as his own unique portrait style began to develop. He first visited Achill Island in Ireland in 1913 and became captivated by the local children, frequently using them as models, while his wife Marjorie helped to entertain and pose them. Although he was enthralled by the Irish culture and residents, he was not able to return to_Achill Island until 1924, but then returned each summer until 1928, staying at “Corrymore,” the home that he and Marjorie acquired. Old Johnnie’s Wife (1913), an elderly couple that the artist befriended. Many of Henri’s early Irish portraits are characterized by a pure simplicity and brightness, which may be partially due to his use of primary colors and a less complex palette. Tom Cafferty (1924). By that time, Henri had adopted even more simplified palettes that used only two or three basic colors, transforming the portraits into formal studies in color and composition. The time that Henri spent in Ireland was extremely valuable to him (it was the only other place besides New York where he purchased a residence), for only there was he able to focus on his painting without the distractions of life in New York. The periods Henri spent in Ireland were among his most prolific, and the paintings that he produced during his Irish sojourns among his most accomplished. Just before his death, Henri composed a tentative list of what he felt to be his most important paintings, and many of the works on this list were his Irish subjects.